11/2015 Haas VF-4SS 5-Axis CNC Vertical Machining Center s/n 1127260 w/ Haas Controls, 24-Station Side Mounted ATC, CAT-40 Taper Spindle, 12,000 RPM, Yaskawa Spindle Motor, Haas Vector Drive,Renishaw OTC Wireless Intuitive Probing System and Wear Systems, RTAP-3 Rigid Tapping, P-COOL 34-Position Programmable Coolant Nozzle, Quick Code, Advanced Tool Management, HLG Liquid Grease, CALM Air Lube Sub-Panel, Hand Wheel, Chip Auger, USB Port, 19” x 52” Table, Coolant. 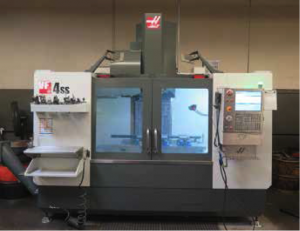 2007 Haas Super VF-2SS 4-Axis CNC Vertical Machining Center s/n 1062226 w/ Haas Controls, 24-Station Side Mounted ATC, CAT-40 Taper Spindle, 12,000 RPM, Inline Direct Drive Spindle, Haas Baldor Spindle Motor, High Speed Machining, High Speed Tool Changer, Haas VOP-B, 16mb Expanded Memory,Coordinate Rotation and Scaling, Intuitive Programming System, Brushless “A”-Axis, Rigid Tapping, 34-Position Programmable Coolant Nozzle, Hand Wheel, Macros, USB Port, Chip Auger, 208/230V, 14” x 36”Table, Coolant. 2011 Haas ST-20SSY Live Turret CNC Turning Center s/n 3090381 w/ Haas Controls 22-Station Live Turret, 5000 Max Spindle RPM, 3000 Max Live Tooling RPM, 2” Thru Spindle Cap, 8” 3-Jaw Power Chuck, 3J Spindle Nose, 5C Spindle Nose, S-26 Collet Pad Nose, Chip Conveyor, Coolant. 2013 Takisawa LA-250 CNC Turning Center s/n CN03AP0022 w/ Takisawa TURN-1 Fanuc Controls, 10-Station Turret, Hydraulic Tailstock, 10” 2-Jaw Power Chuck, Chip Conveyor, Coolant. 2014 Takisawa LA-200 CNC Turning Center s/n C006L80165 w/ Fanuc Series 0i Mate-TD Controls, 12-Station Turret, Hydraulic Tailstock, Parts Catcher, 8” 3-Jaw Power Chuck, 3J Collet Nose, 5C Collet Nose,Chip Conveyor, Coolant, Terry Bar 10-Tube Hydraulic Bar Feed. Victor Taichung VTurn-26HD CNC Turning Center s/n UC2-1121 w/ Fanuc Series 0i-TD Controls, 12-Station Turret, Hydraulic Tailstock, Parts Catcher, 10” 3-Jaw Power Chuck, Coolant. Wickman mdl. 1 ¾”-6 1 ¾” Cap 6-Turret Automatic Screw Machine s/n 680070 w/ 6-Drill Stations, 6-Cross Slides, Chip Auger, 6-Turret Bar Feed, Coolant. Wickman mdl. 1”-6 1” Cap 6-Turret Automatic Screw Machine s/n 680070 w/ 6-Drill Stations, 6-Cross Slides, Chip Auger, 6-Turret Bar Feed, Coolant. Brown & Sharpe No. 2G Automatic Screw Machine s/n 9375 w/ 6-Station Turret, 3-Cross Slides, Bar Feed, Coolant. Brown &amp; Sharpe No. 2 1” Cap Automatic Screw Machine s/n 542-2- 3255-1 w/ 6-Station Turret, 3-Cross Slides, Bar Feed, Coolant. 2006 Amada HA-250W 10” Automatic Hydrauic Horizontal Band Saw s/n 25750046 w/ Amada Controls,Hydraulic Clamping and Feeds, 27-300 Dial FPM, Chip Auger, Roller Conveyor, Coolant. 2005 Amada HA-250W 10” Automatic Hydrauic Horizontal Band Saw s/n 25750276 w/ Amada Controls,Hydraulic Clamping and Feeds, 27-300 Dial FPM, Chip Auger, Roller Conveyor, Coolant. Bewo Type CPO315LT Miter Cold Saw s/n 33121052 w/ 2-Speeds, Speed Clamping, Coolant. Wilton mdl. 8014 14” Vertical Band Saw s/n 0003051 w/ Digital Speed Indicator, Blade Welder. (2) Bridgeport Vertical Mills w/ Sony C80 Programmable DRO, 2Hp Motor, 60-4200 Dial Change RPM, Chrome Ways, Power Feed, 9” x 48” Table. Jet 12” Pedestal Disc Sander. Ingersoll Rand SSR-UP6- 25-150 25Hp Rotary Air Compressor s/n PX7691U06265 w/ 92 CFM @ 150 PSIG, 120 Gallon Tank, 34,436 Metered Hours, Ingersoll Rand “Dry Star” Refrigerated Air Dryer. 2015 Haas TR210-2010 8 ¼” (4 th /5 th Axis) Tilting 2-Axis Trunion Table (NEW IN CRATE). 2015 Haas HRT210-2010 8 ¼” 4 th Axis Rotary Head (NEW IN CRATE). (2) Haas 4 th -Axis 5C Rotary Heads. Kurt 6” and 8” Angle-Lock Vises.